To meet the increasing need for flexibility in displaying digital content, multiple adapter options, including HDMI and VGA, are now a standard upgrade as classrooms are renovated. This allows instructors to connect their personal computers and incorporate many different types of audio/visual content in their courses. In addition, classrooms are outfitted with dual projection systems, enabling faculty to display multiple digital inputs side by side or to display a single input while simultaneously using chalkboards or dry-erase boards on the other side. Classrooms are also equipped with cameras and microphones to record lectures for students to view later in Blackboard. Touch screens simplify the use of these technologies, allowing instructors to operate multiple projectors, adjust lighting, manage audio levels, and even close window shades from one control panel. Common tasks are automated to streamline technology setup and configuration. For instance, when an instructor selects a projector on the touch screen, the projector turns on, the screen descends from the ceiling, the room lights dim, and the window shades close – all completed automatically from the touch of a single button. As more students bring their own laptops, tablets, and smart phones to use in class, the demand on the wireless network continues to increase. University IT responded to this trend by increasing the saturation of wireless access points in academic areas and providing more electrical outlets to charge mobile devices. 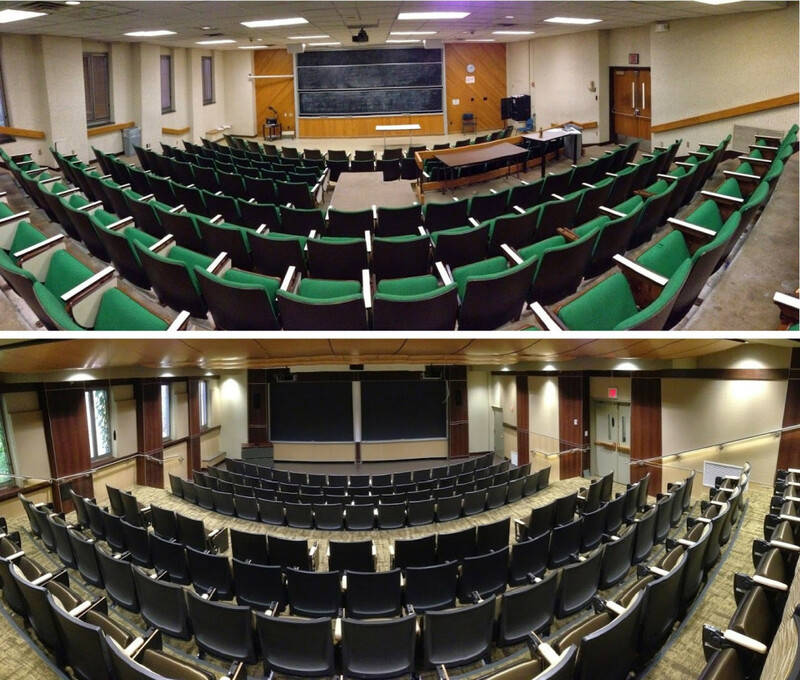 Dewey 1-101 is a theater-style classroom used by many departments, including business, psychology, brain and cognitive science, and mechanical engineering. It also regularly hosts visiting families on undergraduate admissions tours. This year, the room underwent a complete overhaul that introduced new technology and modern design features like mobility-friendly seating and wood-trimmed fixtures. In addition to the universal features detailed above, Dewey 101 includes a cinema-grade projector that pairs with a Dolby 7.1 sound system. When this system is in use the window coverings can be set to blackout, which blocks all natural light and creates an immersive cinema experience.